1. 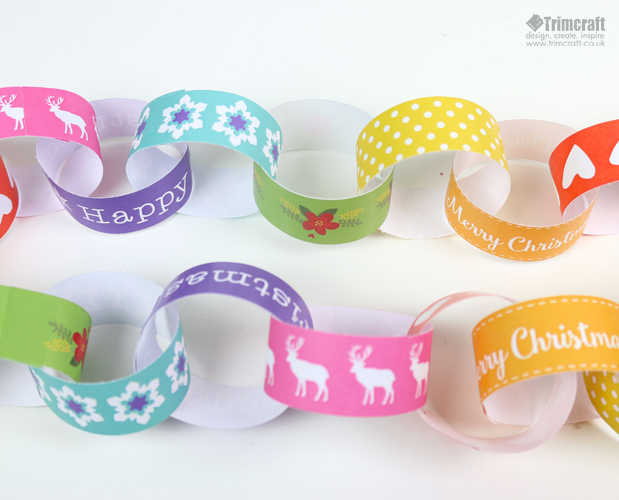 Begin by printing off your free paper chains template. With your printable vertical, cut the excess from both the left and right hand side with a paper trimmer or scissors. 2. Next, cut out each individual strip horizontally. TIP You can print this template as many times as you like and you can save it for next year! 3. Once you’re happy with the amount of strips you have, loop one paper chain and secure each end together with Dovecraft Perma Fix Tape. 4. Loop another strip through your first paper chain and adhere as before. Repeat these steps until you have a complete chain. TIP Alternate the coloured strips to make your paper chain really stand out. This easy project will be wonderful way to inject colour in to your home and with how simple it is to do, it's the perfect craft to do while you watch Christmas movies and munch away on your festive snacks!